Made this for my last camping trip ans it was a hit! Even my picky 3yr old & 5yrold loved it. I have to admit I ate most of it myself. �cooking about another batch as I�m typing for another weekend camping trip..
2. Drain and cool the potatoes. I put them in a separate bowl and once they cooled enough I put them in the fridge to cool all the way. This gave them an excellent texture and prevented the dairy ingredients from getting hot or the cheese from melting. 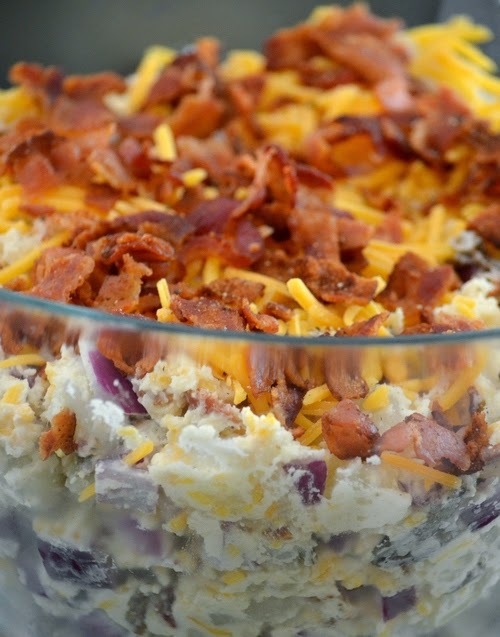 If you are serving this salad hot then you don�t need to cool the potatoes, just skip step 2! 3. Mix the mayo and sour cream together in a bowl. Add to the potatoes, then add the onions, chives, and cheese. Salt and pepper to taste � I use a pepper grinder and a sea salt grinder for EVERYTHING so I never know exactly how much of either I put in. I think the taste is far superior to just using regular table salt and pepper.